MAC Cosmetics is giving their Select Members 25% off their entire order! 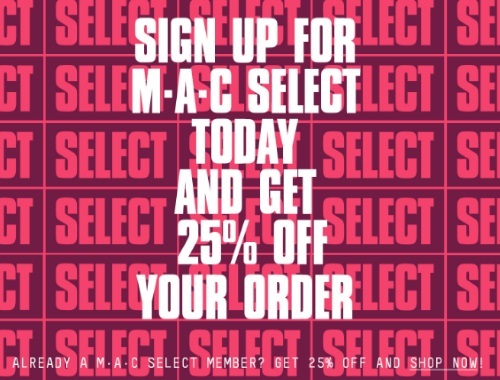 If you're already a MAC Select member just checkout as normal and you will see a 25% off discount on the items in your shopping cart. If you aren't a Select Member yet, sign up here. It's free and it's MAC's new rewards membership. This 25% off discount is valid until December 4 (starts in-store on November 29 but is valid right now online). Also, for Cyber Monday you can get a Complimentary 5 Samples Kit with any purchase online that we blogged earlier, this combined with the 25% off is a great deal!